Let me start by saying, I love post-it notes! I can never have enough. I have plenty of them at school and home. We use post-it notes in our daily lives. Oftentimes, we use them to jot down notes or quick reminders. 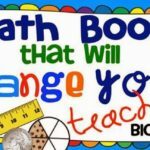 But today, I wanted to share how you can use them during your math class. 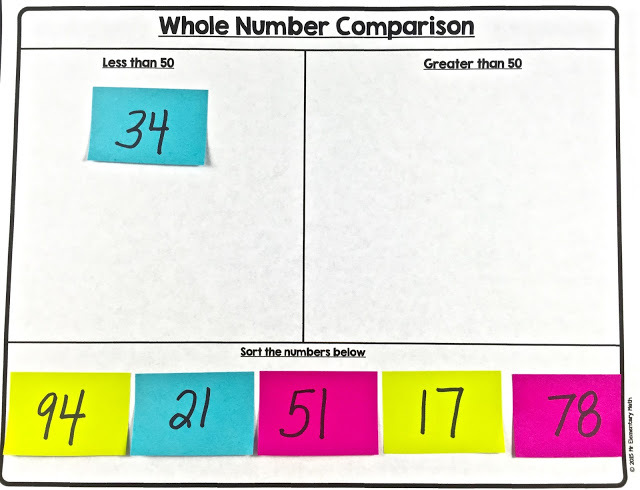 This post has plenty of example photos so that you can see how sticky notes are used to teach or reinforce a variety of math standards and concepts.Let’s get started! 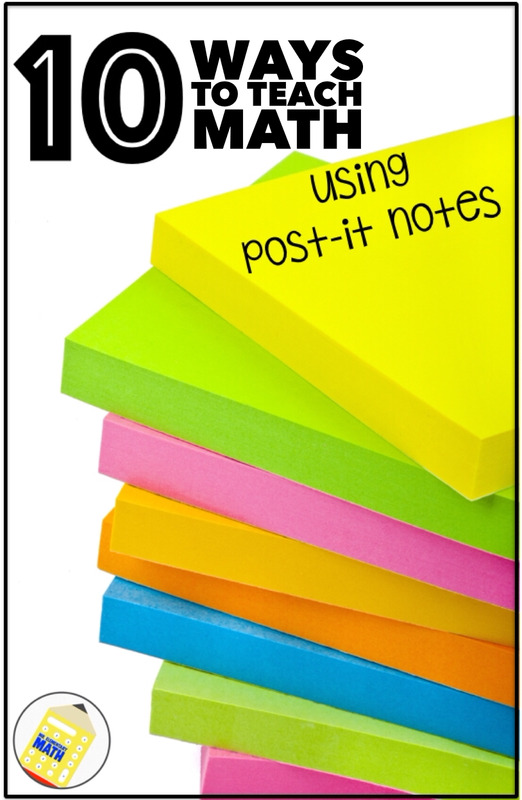 Here are 10 ideas to teach math using post-it notes. Since I like to spread the love, 5 ideas relate to the primary grade concepts (Kindergarten – 2nd) and 5 relate to the upper-grade concepts (3rd – 5th). 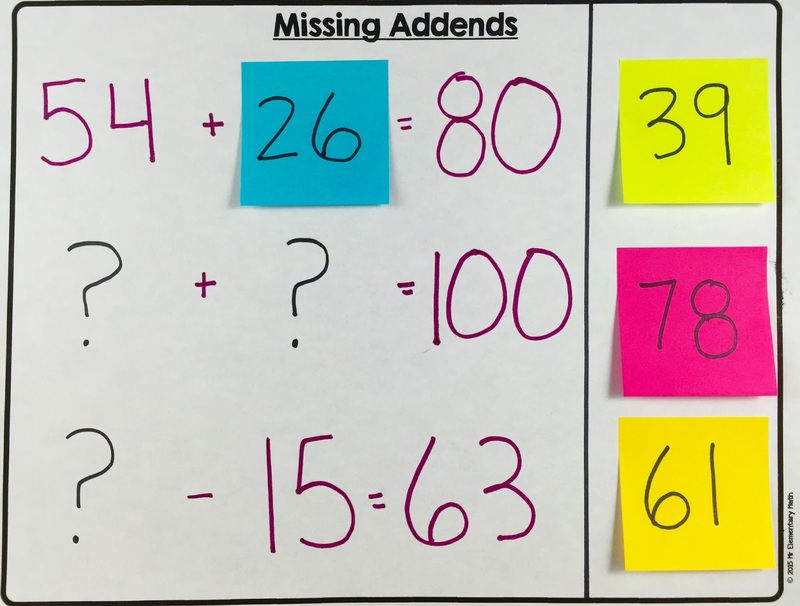 Instead of using a worksheet to review missing addends, have students manipulate post it notes to show mastery. Odd and even numbers are primarily covered in 2nd grade. 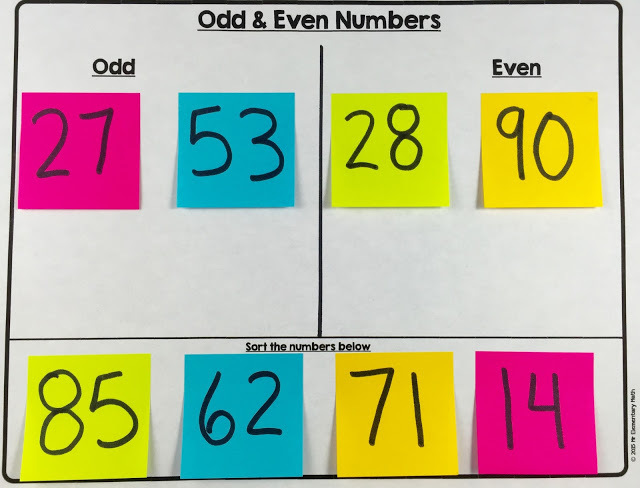 After students have a deep knowledge of what makes a number odd or even, they can use this sort using sticky notes to show mastery. Learning about fact families can be a little dull. Spice them up with the use of post-it notes. 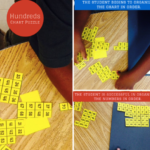 I would recommend allowing your students to use manipulatives (ex. linking cubes) as a support to go along with this activity. Comparing numbers is a skill that can get old. 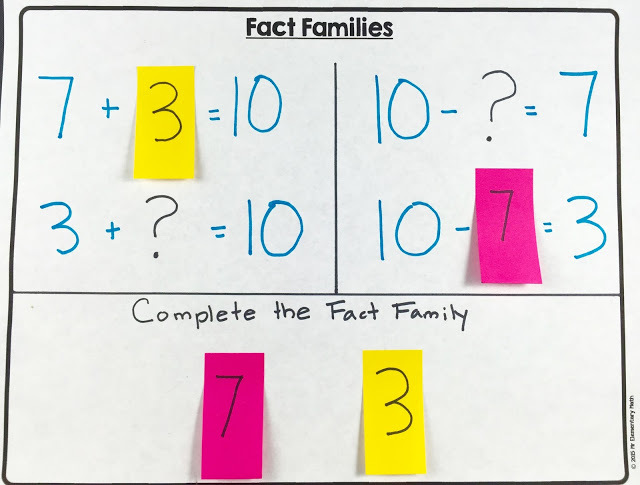 Make it more interactive by having students work with a partner and sort sticky notes into the correct categories. Have your kids compare numbers using benchmarks such as 10, 25, 50, 100, etc. 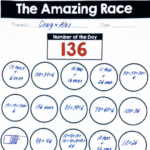 You could also use this same format when comparing decimals and fractions. Rounding using post-it notes gives students opportunities to practice with a more than one numbers at a time. 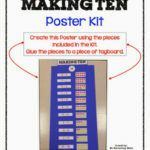 It can also be an easy to make center activity. Reinforce multiplicative thinking by using post-it notes to represent groups of items and then allow your students time to discover the factors that represent the picture. 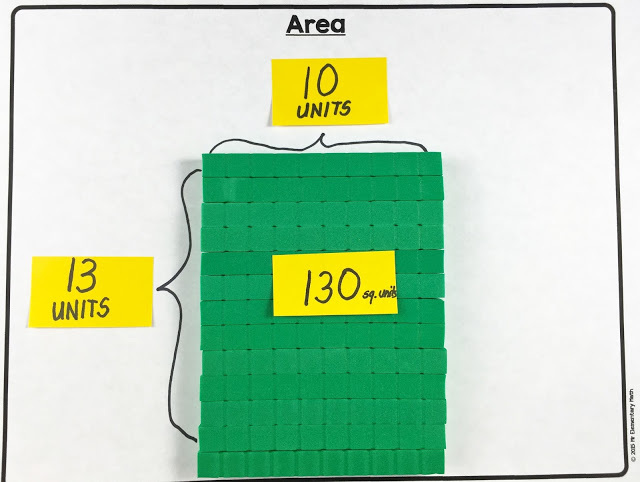 Build area models with base ten blocks and then have your students label their model using sticky notes. Fractions, fractions, fractions…. Students need on-going practice with fractions. In the example below, I used one-half as a benchmark fraction for students to make a comparison. 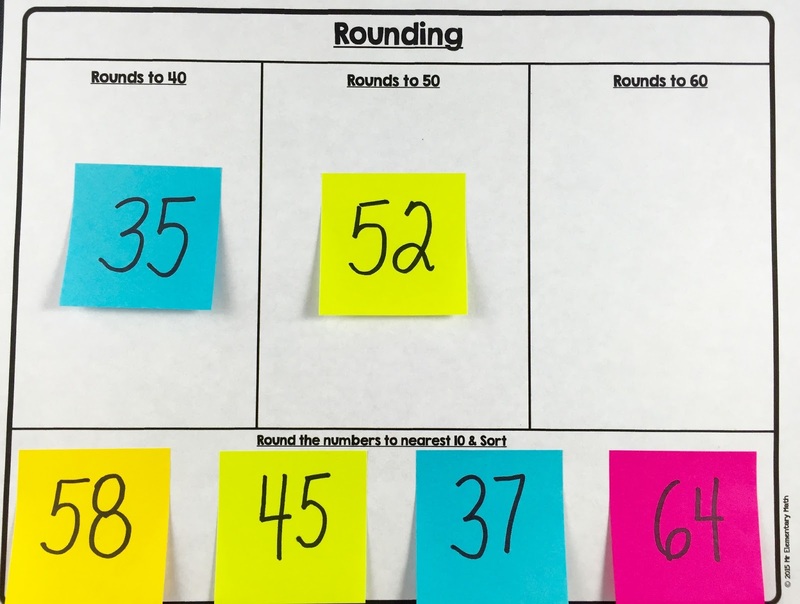 This is a great activity because your students will need to reason and make viable arguments about how they sorted. Ordering decimals can be a challenging task for our students. Use this simple to create activity as a center to reinforce decimal understanding. 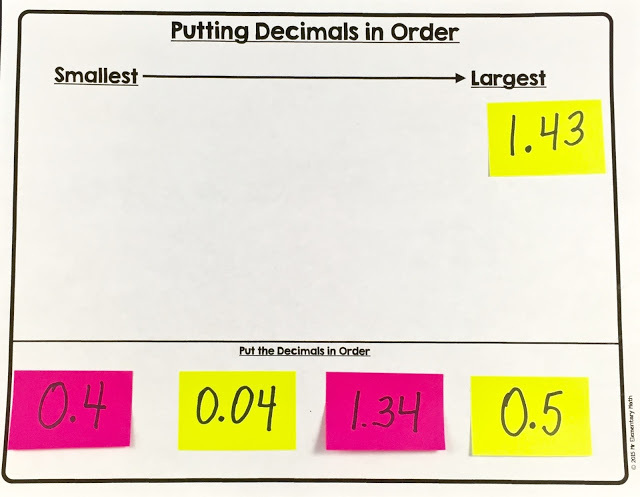 Students arrange the post-it notes in order from smallest to greatest. UPDATE: To download the templates above click here. As you can see, there are many ways that you can use post-it notes to support student learning in math. 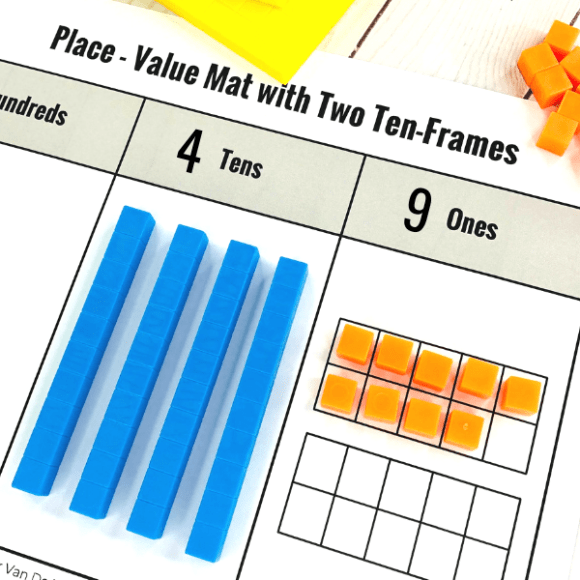 They also come in handy when making a quick math center. Which of the ideas above would work well in your classroom? 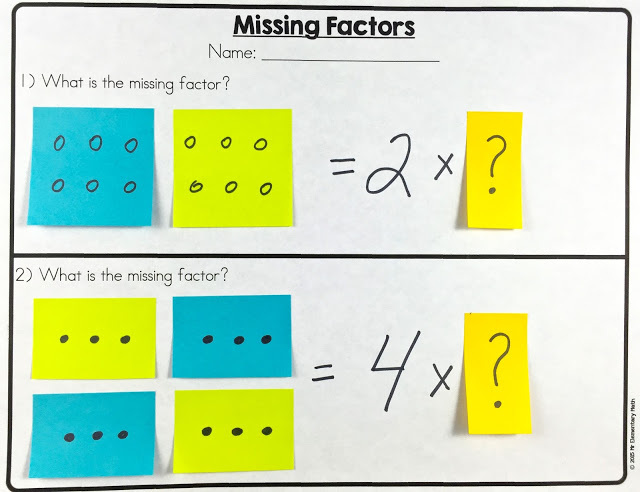 Do you have any other ways you currently use sticky notes during your math lessons? Leave them in the comments section below. I use post it notes in many ways, but you gave me a few new ideas!!! Thank you!!! Thanks Lorie! 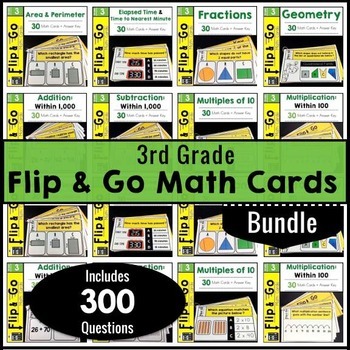 Do you have any ways that you use them in math that are not listed? Thanks so much for this! Brilliant for reluctant writers. This looks great. Thanks so much for sharing, but I'm not seeing the templates at the end of the blog post. Thanks! Click on "UPDATE: To download the templates above click here" It is a text link. I am a high school Algebra teacher. I use post-its when I am teaching linear systems of inequalities. As I graph the lines for the system, I use the post-it to cover up the side of the line not shaded, so when I am done, the only part of the graph showing is the part that is shaded by all lines in the inequality. I use post it notes with my middle school math students in a more traditional way. I have them use one color of post it notes sticking out of the top of their consumable books to mark vocabulary words. They also write short one line notes (dividing fractions, for example) that stick out of the side of their consumable books to mark the "recipe" for how to do a certain type of problem. They remove the tabs after testing on each chapter. Great ideas!!! THANKS FOR SHARING!!! I am a math tutor. Your suggestions are so useful. It is a colorful, creative way to practice math facts. Thanks for asking. I do not have any products that incorporate multiplying multi digit numbers. I will be working on that in the near future. Please give me your email address so that I can email you once it is completed. Thank you for the free items!! 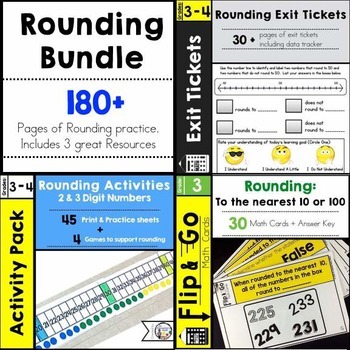 Do you have anymore games or worksheets for rounding and multiplying multidigit numbers with decimals? I have e students really struggling in both of these areas. Love these activities! Thanks for the ideas! 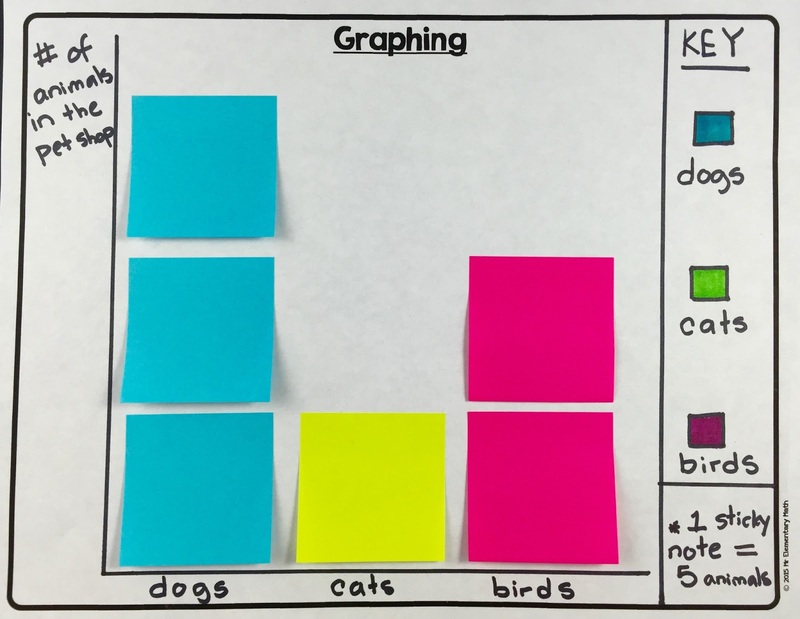 I enjoyed reading your post about how to use sticky notes in the classroom. In the past, I've simply used them to write encouraging notes on when students are taking tests. I never thought about using them in some of the ways you shared. They are a cheap and easy way to make manipulatives for students. I especially liked the one about charting decimal numbers on a number line. I liked Kelly Hall's idea of using them for division too. My kids don't do long division this year, but sometimes they line up their addition and subtraction wrong. Thanks for sharing!! Your welcome Tessa and thanks for you comment. I like the decimal one also because you can also use the same idea for ordering whole numbers and fractions. I was looking for some way to reinforce odd and even numbers when I saw your email! Thank you for sharing! I plan to use it today for my intervention time. Your welcome! I'm glad you found something that you can apply in your classroom. Your welcome! 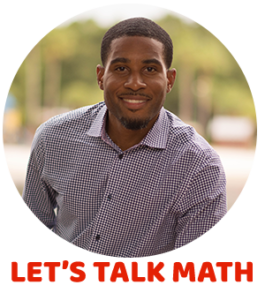 I wanted to share a range of ideas for all grade levels. There are so many more ways you can use post it notes, but I wanted to stick to just 10. I use sticky notes when teaching long division. It keeps them focused on one digit at a time and things stayed lined up. I love your ideas!!! Thanks for sharing. 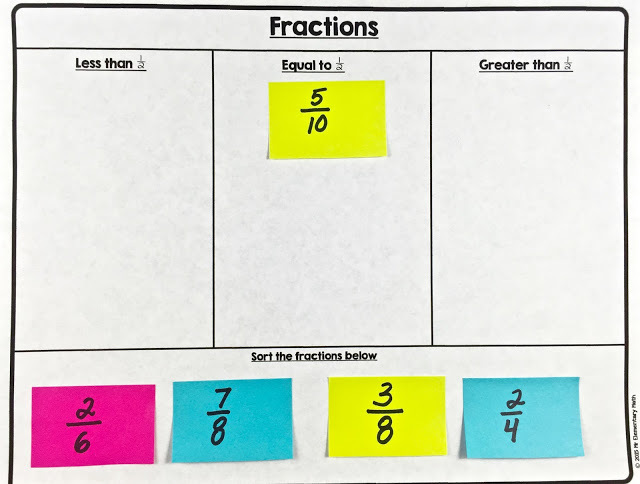 Thanks for sharing how you use sticky notes with long division. I would love for you to share a picture so that I can post on my Pinterest board. Thanks for sharing your Pinterest link. I liked your idea of using sticky notes to help kids line things up but was having trouble picturing how it works. Your picture definitely cleared that up! I love this. Do you sell any of the templates? Thanks for asking. I just uploaded the templates to the end of the blog post for free. Hope you enjoy!